On November 7, 2016, former JALBCA Co-Presidents Barbara Ryan and Martha Golar joined with the WBASNY Capital District members for a lunch-&-learn. The program took place in the Third Department Conference Room of the Presiding Justice, Karen K. Peters. Barbara and Martha provided a capsule history of JALBCA, including the rationale for its formation, the projects it has initiated and been engaged in over time, and the special role it serves for members of the legal community. With respect to immunotherapies, Ms.Lahrs noted that immune-oncology supports the immune system’s inherent ability to recognize and eliminate tumor cells. Immunotherapies apply to all tumors at all stages and have a lower potential of adverse reactions than chemotherapy. They may be used in conjunction with other treatments (e.g., surgery, chemotherapy, radiation, targeted therapy). She also mentioned checkpoint inhibitors- drugs, often made of antibodies, that unleash an immune system attack on cancer cells. Examples on the market include Atezolizumab (approved for non-small cell lung cancer), Ipilimumab (approved for melanoma, lung cancer, kidney cancer, blood cancer, or head and neck cancer), Nivolumab (approved for melanoma, non-small cell lung cancer, renal cell cancer, Hodgkins lymphoma, and metastatic squamous cell carcinoma), Pembrolizumab (approved for melanoma, non-small cell lung cancer, and head and neck squamous cell carcinoma) and Ipilimumab (approved for advanced melanoma). Another – tremelimumab – is under development. JALBCA members who are cancer survivors meet bi-monthly at members’ apartments to discuss issues of interest to survivors both personal and professional. In addition, survivors are charged with developing new ways of reaching out to newly diagnosed cancer survivors in the legal field to provide support and information on a one-to-one basis. If you are interested in attending these informal meetings, please send your contact information to Jennifer Fiorentino at jennifer@nulljalbca.org and you will be supplied with the details of our next meeting. On Wednesday, November 9, JALBCA was honored by the National Breast Cancer Coalition (NBCC) at its 21st New York Gala at the Essex House in New York City. JALBCA and two outstanding advocates were honored for their work toward NBCC’s mission to end breast cancer. Former Co-President Sharon Nelles accepted the award for JALBCA. 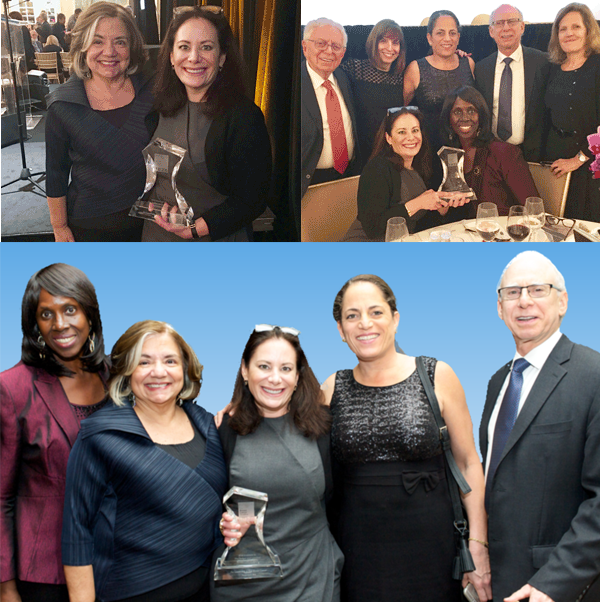 NBCC President Fran Visco presented the 2016 Leadership Award to JALBCA’s Sharon Nelles, a partner at Sullivan and Cromwell, and a member of JALBCA’s Board. JALBCA was honored for its activism and involvement as a major supporter of NBCC’s Project Lead. On December 13, President Obama signed The 21st Century Cures Act which provides for certain public funding for biomedical research and numerous provisions aimed at adjusting how the Food and Drug Administration (FDA) evaluates new medical products and new indications for existing prescription drugs and devices. It was purportedly designed to accelerate the development of new drugs and medical devices and increase federal funding for biomedical research. – this includes $1.8 billion for Vice President Biden’s “Cancer Moonshot” project, $1.5 billion for the Brain Research through Advancing Innovative Neurotechnologies (BRAIN) Initiative (announced by President Obama in April 2013 as a research effort to revolutionize our understanding of the human brain and uncover new ways to treat, prevent, and cure brain disorders such as Alzheimer’s, Parkinson’s disease, schizophrenia, autism, epilepsy, and traumatic brain injury), and $1.5 billion for its Precision Medicine Initiative. The FDA will be eligible to receive an additional $500 million over 10 years, though critics would argue that this amount is inadequate to cover the additional workload for the FDA under the new law. In addition, states may apply for $1 billion in federal grants over two years to address opioid abuse and addiction. Unfortunately, these funds are not guaranteed. Importantly, funding will be subject to annual Congressional approval – the mandatory spending feature was changed to discretionary spending in the final version of the Act. Earlier versions of the bill contained some requirements for industry to contribute to the cost by, for example, requiring companies to provide offsets for the new spending (e.g., certain drug companies would have been obligated to make their products available to generic manufacturers), but this requirement was dropped in the final law, as were other requirements resisted by industry. Instead, funds for the new law will come from sales drawing down the U.S. strategic petroleum reserve and cutting $3.5 billion (about 30%) from the Affordable Care Act’s prevention and public health fund. The Cures Act contains many provisions, covering areas such as promoting drug development, development incentives for certain classes of drugs, digital health, regulation of clinical research, changes in Medicare and Medicaid reimbursement, facilitating collaborative research, and fraud and abuse. Some of these are identified below. Under the Act, there would be a review pathway at the FDA for biomarkers, an increase in patient participation in the drug-approval process, and a requirement that the FDA evaluate “real-world evidence” to support new indications for existing drugs. Some who have concerns about the latter feature have noted that (1) real-world evidence, which is defined as information on drug outcomes that is derived from sources other than clinical trials (and includes, therefore, observations, safety and side-effect claims, patient input, anecdotal and other data not subject to rigorous analysis) is less likely to have been uniformly collected and therefore risks being less reliable and (2) attempted analysis of real world information may have systematic differences between populations of interest that may not be captured and, therefore, cannot be adequately controlled, which can distort the true benefits and risks of a drug. (href=”http://healthaffairs.org/blog/2016/11/30/the-current-21st-century-cures-legislation-is-still-a-bad-deal-for-patients/ ) Proponents of real-world evidence would argue that this is a way to apply useful and timely information, learned other than from clinical trials, to drug approval. Another concerning provision for some involves a new “limited population” approval pathway for antimicrobial products (antibacterial or antifungal drugs) used to treat serious or life-threatening infections in a limited patient population with unmet needs, based on a sliding benefit-risk scale, factoring the severity, rarity, or prevalence of the infection to be treated and the availability of alternative therapies. This would be permitted even if the benefit-risk profile may not justify approval for a broader patient population. Manufacturers would be required to affix disclaimers flagging this pathway in the drug’s labeling and to submit promotional materials to the FDA for inspection. But critics would argue that research has shown that consumers rarely read, let alone heed, health disclaimers and, in addition, the FDA has been increasingly restricted in its efforts to regulate pharmaceutical promotion for unapproved or off-label uses. Certain sections of the Cures Act relate to medical device regulation and one modification in this area relates to “breakthrough” devices. The law establishes an expedited review program for breakthrough devices. It is similar in concept to the FDA’s existing breakthrough designation program for drugs, but broader in scope. Concerns about this provision focus on the fact that, as now defined, a device can be characterized as a breakthrough even if its possible advantages are not “clinically meaningful” and many new, high-risk devices could then qualify for this pathway, notwithstanding that faster reviews of high-risk medical devices have been associated with increased reports of post-approval safety problems. Further, government payers like Medicaid and Medicare would be forced to cover these treatments, and private insurers would be forced to play a heightened gatekeeping role, though it can be expected that the provisions will lead to greater use of new and costly treatments before their efficacy and patient risk exposure is adequately known. The Act broadens the Humanitarian Device Exemption (HDE) program for devices intended to treat or diagnose a condition that affects a small patient population, by increasing the cap on the number of patients affected from 4,000 to 8,000. The increase in the patient population cap would likely make the HDE pathway more available to device sponsors and facilitate more devices intended for the treatment or diagnosis of rare diseases to enter the market. Individuals to authorize future use of their information for research. Health Reimbursement Arrangements for Employees Who Buy Their Own Insurance. The Act includes an aid to small business. Title 18 of the new law, originally a separate bill called the Small Business Healthcare Relief Act, allows companies to use Health Reimbursement Arrangements to compensate employees who buy their own insurance. As of January 1, 2017, a company with fewer than the equivalent of 50 full-time employees – i.e., a business not subject to the employer mandate of the Affordable Care Act to offer insurance coverage to employees – can reimburse employees (up to certain dollar amounts, indexed for inflation) for purchasing individual health insurance as if it was directly paying the premiums on a group health policy. The employee will not have to pay taxes on the company’s premium contribution, and the company will not owe payroll taxes on it. In addition to increased funding for research, some features of the Act would seem to be indisputably positive. These would include, for example, strengthening the FDA’s ability to hire, train, and retain experienced staff scientists needed to evaluate greater and increasingly complex data. Further, the Act requires manufacturers to publicly disclose how, if at all, they may make experimental therapies accessible to patients with serious or life-threatening conditions who do not qualify for clinical trials. Editor’s Note: Links to multiple sources used to prepared this article are noted above.